December 2 practice notes: Mitchell’s purgatory, Clifford update, pizza! 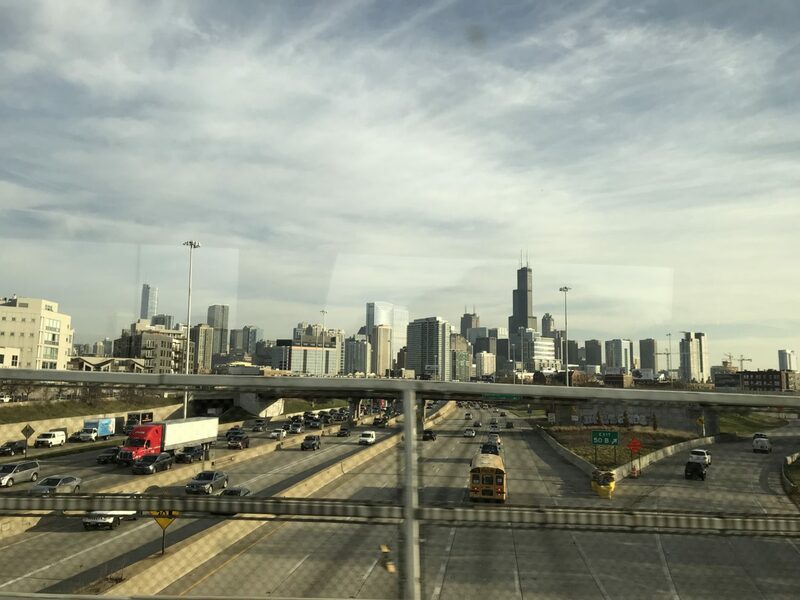 Good evening from Chicago, the final stop of the Kings’ four-city tour through the Midwest and our nation’s capital. Los Angeles scheduled a 1:00 p.m. practice, but the few regulars who took the ice did not stay on for very long. 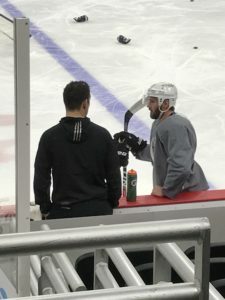 By the end of the skate, Pierre Turgeon led Torrey Mitchell and Kyle Clifford on some conditioning sprints as others trickled out of the dressing room and weight rooms towards the first team bus. JS reaffirms Clifford not quite yet day-to-day. Still needs to continue to build up strength. -As for Mitchell, yes, we saw the whites of his eyes. We also had a nice conversation with him! As noted yesterday, his visa was secured, and he beat the team to Chicago yesterday evening by several hours. His arrival, of course, followed three and a half days in Detroit in which he was confined to his hotel room because he had to be ready at a moment’s notice for a call informing him that he’d have to report to the immigration office. “Yeah, it was, ‘we’re working on it,’ and they’re expediting my work visa, and then it was for some reason or another not done by the end of that day,” he said of the bureaucratic delay, which continued after the team’s game in Detroit on Tuesday. While the team traveled to Washington, D.C., he remained at the hotel to deal with immigration paperwork that bled into Friday. “I was on call [Wednesday] morning. And then I’d get a call at around noon like, ‘they’re processing it,’ and … “you should be hearing shortly,’ and, ‘oh, they just sent us some papers and we’ve got to wait a little bit longer here,’” he said. He laughed it off and kept an open mind to being stuck in travel purgatory. The hardest part was not really being able to leave the hotel. He also watched Showtime’s Billions, which he loved, and the Kingsmen movies. And then he was back on the ice at the United Center on Saturday going through sprints. It’s been a long week, but if needed, he’d be available tomorrow, at least by virtue of his completed paperwork. “Yeah, that’s the plan. I think, just try to get in shape and when your name’s called, be ready to go,” he said. An indication of whether he’ll play the Blackhawks will be revealed during Sunday’s morning skate. -Meanwhile, the Kings were back in the visitors’ dressing room at the United Center, the same one they celebrated in after winning the 2014 Western Conference Championship. It’s three and a half years removed from Alec Martinez’s bank shot off Nick Leddy, but Anze Kopitar recalls the feeling of returning to the room from which he spoke on Saturday. He was “pretty tired” after the seven-game heavyweight bout, but did put into words the immediate feeling of having emerged from the 21-game western marathon. -More than a dozen pizza boxes arrived for the players just prior to leaving the rink, and no, it wasn’t deep dish, Chicago-style pizza. It might take another 21 games to burn off some Lou Malnati’s. Self-styled “pizza expert” Jeff Solomon declined to fully go on the record with his pizza preferences as to not sow discord in the locker room, but did state his preference for a New Jersey-style pie. John Stevens, who regularly embarks on morning runs in the cities he visits, has some pizza preferences but remains a commendably healthy eater. He’ll splurge occasionally, though.